These standards are based upon those reported in the proceedings of the CBSG/WAZA Amphibian Ex situ Conservation Planning Workshop, El Valle, Panama, 12-15th February 2006. We also have a separate document about raising amphibians in the classroom. An updated manual for Biosecurity and Permanent Isolation of Ex Situ Conservation Populations was produced in March 2017. Ex situ breeding of selected amphibian species is recognized as an essential and integral part of the IUCN Amphibian Conservation Action Plan to stem the loss of amphibian species worldwide. However, the emergence of the infectious disease chytridiomycosis (caused by the fungus Batrachochytrium dendrobatidis) as a significant factor in the recent decline and extinction of many amphibian species, raises specific challenges for ex situ conservation. Additionally, the difficulty and expense involved in reliably testing amphibians for this disease means that it may often go undetected for extended periods of time and even re-emerge in animals thought to be negative. The AArk highly endorses the practice of working with species within their native range, or if they must be exported, to practice safe husbandry. See The Manual for Control of Infectious Diseases in Amphibian Survival Assurance Colonies and Reintroduction Programs for best practice biosecurity guidelines. Furthermore, we highly recommend that all animals intended for release are maintained as near to their range as possible and isolated from allopatric populations. Therefore, the safest and most responsible way to proceed with the keeping of all amphibians in captivity is to treat all animals as potentially infected (with chytrid and/or other pathogens) and avoid the discharge of potentially infectious water and other materials into the environment (where they may infect local native amphibian populations). 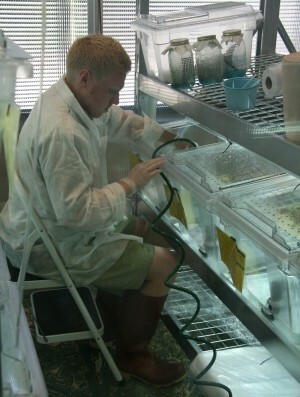 Furthermore, increasing awareness of biosecurity issues and introducing a quarantine-like approach to amphibian husbandry of enclosures/rooms within an institution and between institutions will significantly reduce the risk of an epidemic outbreak of chytridiomycosis (or other disease) in captivity. Attempting to screen for and treat, known and unknown diseases is no substitute for bio-security – i.e. implementing strict and thorough quarantine and maintaining high levels of barrier management. For more information on chytrid fungus detection, management and treatment see the chytrid fungus page on this web site. Specimens maintained ex situ for Educational* purposes with no requirement for research and no prospect of release to the wild. Separate footwear per room and/or footbaths at entry/exit. 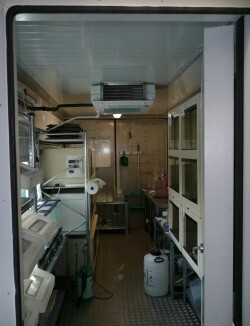 Treatment/decontamination of all waste water from enclosures and rooms housing amphibians prior to discharge/disposal. Incineration (or disinfection by means of suitable chemicals, heating to 60°C for 5 minutes, or complete desiccation) of all amphibian enclosure waste – soil, leaves, plants, food items, faeces, bodies (after post-mortem examination). Escape-proof housing of a size appropriate for species. Pest-proof housing (rodents, cockroaches, ants, etc.) to prevent pathogen transfer, predation of amphibians, and escape of food insects. Water free of pathogens and chemical contaminants. Regular water changes – automated or manual. Appropriate cage furnishings wherever necessary. Exposure to natural light (or good artificial equivalent) if exposure is normal in natural history of the species. Appropriate temperature/humidity for natural history of the species. Appropriate food, dependent on species – with supplementation (vitamin/mineral). Individual instruments (tongs, nets, bowls, tanks, pumps, filters etc) per enclosure and/or species. Change gloves (non-powdered) for each enclosure. Design of enclosure should minimize keeper/animal contact. Maximize use of automation in water quality maintenance/watering. Maintain a consistent/directional flow of husbandry routine – from low risk and high importance species/individuals to high risk and lower importance species/individuals. Climatic conditions (lighting, photoperiod, temperature, rainfall, humidity, etc) should follow the natural cycle for the species and be automated wherever possible. One species or local assemblage of species per room/unit – a state of permanent quarantine. Separate uniforms/overalls per room (stays in room unless disposable). Food coming from known and trusted source; three-month period of familiarization with natural food types recommended prior to any release. Pre-release, monitor condition of specimens to determine fitness for release – thorough health screening including; regular and frequent PCR screening for chytrid fungus over several months; screening for Ranavirus; regular bacteriological and parasitological screening; and thorough necropsy and histological examination of deceased animals and a representative subset of the intended release animals – see Pessier, A. P. (In press): Management of disease as a threat to amphibian conservation. International Zoo Yearbook, 42, for a comprehensive overview of amphibian health screening needs. *Conservation Roles Simply keeping and breeding threatened amphibian species in captivity does not in itself equate to conservation. As part of a genuine amphibian conservation initiative, ex situ captive management must have a clearly defined role in the conservation of the species or its habitat. Eight Conservation Roles have been defined, and these are calculated for each species, based on the data provided during conservation needs assessment workshops. Ark A species that is extinct in the wild (locally or globally) and which would become completely extinct without ex situ management. Rescue A species that is in imminent danger of extinction (locally or globally) and requires ex situ management, as part of an integrated program, to ensure its survival. In Situ Conservation A species for which mitigation of threats in the wild may still bring about its’ successful conservation. In Situ Research A species that for one or more reasons requires further in situ research to be carried out as part of the conservation action for the species. One or more critical pieces of information is not known at this time. Ex Situ Research A species undergoing specific applied research that directly contributes to the conservation of that species, or a related species, in the wild (this includes clearly defined ‘model’ or ‘surrogate’ species). Mass production in captivity A species threatened through wild collection (e.g. as a food resource), which could be or is currently being bred in captivity – normally in-country, ex situ – to replace a demand for specimens collected from the wild. This category generally excludes the captive-breeding of pet and hobbyist species, except in exceptional circumstances where coordinated, managed breeding programs can demonstrably reduce wild collection of a threatened species. Conservation Education A species that is specifically selected for management – primarily in zoos and aquariums – to inspire and increase knowledge in visitors, in order to promote positive behavioural change. For example, when a species is used to raise financial or other support for field conservation projects (this would include clearly defined ‘flagship’ or ‘ambassador’ species). Supplementation A species for which ex situ management benefits the wild population through breeding for release as part of the recommended conservation action. None Species that do not require any conservation action at this point in time. This list may also contain species that were not evaluated during the workshop due to lack of data being available. NB – ex situ includes any and all animals removed from their wild habitat whether within or outside of their native range and country. Download this page as a pdf file. Murray, K., Skerratt, L., Marantelli, G., Berger, L., Hunter, D., Mahony, M. and Hines, H. 2011. Guidelines for minimising disease risks associated with captive breeding, raising and restocking programs for Australian frogs. A report for the Australian Government Department of Sustainability, Environment, Water, Population and Communities.